Angela Merkel’s New Year’s address marked a departure from her usual hesitant style of politics. The German chancellor condemned Pegida, a populist movement whose name roughly translates as Patriotic Europeans against the Islamisation of the Occident. Since October, Pegida has been holding weekly anti-immigrant rallies, the most recent of which, in Dresden, has attracted 18,000 protesters. Pegida’s leaders are keen to appear as respectable citizens (a tough sell: in 1998 the movement’s chief rabble-rouser, Lutz Bachmann was convicted for burglary and fled to South Africa to avoid a three-and-a-half year prison sentence) and disavow any links to right-wing extremist ideology. Despite the movement’s name, its aims are somewhat diffuse and given their dissatisfaction with established parties and skepticism of the media Pegida’s protagonists refuse to enter into dialogue with outsiders. A 19-point document serves as an insurance policy and outlines the movement’s demands ranging from a more efficient asylum policy and the deportation of criminal asylum-seekers to opposition towards political correctness, the use of gender sensitive language and the establishment of sharia courts in Germany. The sentiments behind those demands and of those who attend the rallies are more overtly xenophobic than its “policy document” would suggest. The movement has a rather uneasy relationship with facts: the establishment of sharia courts in Germany is not imminent, and foreigners are net contributors to Germany’s social security system rather than the leeches Pegida claims they are. The 2% of Muslim girls who do not attend swimming lessons at school are hardly a threat to German culture as the movement’s supporters would have it. That Pegida has its roots in Saxony is particularly absurd, at the 2011 census foreigners made up a mere 1.9 per cent of the population, and only 0.1 percent are thought to be Muslim. Even in the state’s largest cities Dresden and Leipzig the foreign population is small: 3.5 and 4.2 per cent, respectively (though some protesters are keen to stress that they fear eastern cities are becoming like those in the West). Pegida’s marches are drawn from a broad mix of people, including ordinary conservative mainstream, but their weekly gatherings also provide a platform for neo-Nazis of the National Democratic party (NPD) and football hooligans. Pegida is able to mobilise those on the extreme right of the political spectrum, who on their own would be met with more suspicion, and thus provides an acceptable home for right-wing extremist ideas. The emergence of Pegida has taken mainstream political parties by surprise, and politicians struggle to find an appropriate response. In the absence of evidence concrete positions (or evidence of real, rather than imagined concerns) and the movement’s refusal of dialogue, it is difficult for mainstream parties to address the problem. Especially politicians from the centre-right fear that they might alienate large parts of the population and play into the hands of Alternative for Germany (AfD), Germany’s populist anti-Euro party. The general approach is to condemn the organisers and far-right elements amongst those rallying, and to promise to take on board the “legitimate” concerns of the protesters. Describing these concerns as “legitimate” however, is not an appropriate response: it masks the fact they are mostly the result of a fear of being economically and socially excluded from the mainstream. These grievances are rooted in internal economic and social inequalities. Elites may even find it convenient that grievances resulting from greater inequality are directed at outsiders, rather than themselves. The Social Democrats (SPD) are relatively strong in their condemnation of Pegida. Justice minister Heiko Maas said the movement was “a disgrace for Germany”, and the head of the SPD parliamentary group Thomas Oppermann called them outright racist. But party leader Sigmar Gabriel advocated for dialogue with the protestors and engagement with its rather diffuse concerns. Tensions run high amongst Christian Democrats. The CDU appears to have lost its ability to absorb on those on its right of the political spectrum. Former interior minister Hans-Peter Friedrich of the CDU’s Bavarian sister party CSU picked a fight with the chancellor, claiming the success of Pegida and AfD was a result of the party’s abandonment of its conservative roots. Some within the party succumb to populist temptations. Volker Kauder, chairman of the CDU/CSU parliamentary jumped on Pegida’s bandwagon cautioned against the creation of an Islamic political party in German. Not only is the creation of such a party purely hypothetical, the warning against it is also undemocratic. Kauder’s comments came only shortly after a draft CSU party resolution had demanded that immigrant families speak German at home. Unsurprisingly, AfD is more sympathetic towards Pegida (and vice versa). The party shares Pegida’s disdain for the “old parties” and the disinformation and manipulation of traditional politics and the mainstream media. The party’s leaders use every opportunity possible to show understanding of Pegida’s aims and to lash out at those who criticise Pegida for being aloof. The party is the natural destination for Pegida sympathisers. Pegida emerged at a time of a power struggle within AfD that will ultimately determine the extent to which AfD will make Pegida’s scaremongering its own. Bernd Lucke, one of the party’s three speakers who is seeking to become its sole leader, has come under pressure from his colleagues. Lucke as well as his deputy Hans-Olaf Henkel are more concerned about Pegida and warn against too close a connection between AfD and Pegida, because it might not sit well with AfD’s more moderate supporters. If Lucke’s detractors have their way, they stand to open up AfD to those concerned about “excessive immigration of Muslims”. The emergence of Pegida should not be a surprise as there is enormous potential for right-wing populism, particularly in eastern Germany. There have been waves of right-wing populism in the past, and these have waned. It would be too convenient to label Pegida a typically eastern phenomenon, though it is in part a symptom of structural differences between the two Germanies. Concerns about being ignored or lagging behind are not unwarranted: economic insecurity can breed extremism and most eastern districts are economically much weaker than in the rest of Germany (in addition to less exposure to foreigners) and populist or extreme right-wing parties generally fare better in elections. While some are keen to emphasise that the movement is a product of eastern Germany, where far right-wing parties have traditionally fared better in elections than in the west, the views the protesters hold are present in the whole of Germany – and other, though smaller, chapters of Pegida are springing up across the country. A recent study undertaken on behalf of the (SPD-sponsored) Friedrich Ebert Foundation assessed extreme right-wing attitudes and hostile attitudes against groups. The study found that there is large potential for right-wing populism in Germany as a whole. The CDU’s strategy of ignoring or isolating AfD – a necessity given the latter’s anti-European and anti-American creed – has allowed AfD to mop up those who no longer feel represented in the increasingly centrist CDU. AfD and Pegida are a good fit: AfD, though still relatively harmless compared to its European counterparts counts many supporters with above-average right-wing attitudes. The same goes for non-voters – making them potentially susceptible to populist parties. 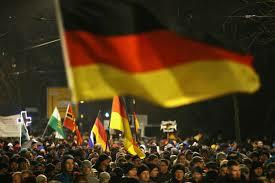 The resurgence of Germany’s right and vocal xenophobia should not be overstated however. The authors of the abovementioned study note that overall, there is a downward trend in xenophobia and chauvinism, though core far-right attitudes such as support of a dictatorship have remained largely stable over the past 12 years. Another recent survey found that opposition towards asylum seekers is on the wane. Pegida’s rallies attract considerable counter protests. The most serious problem however, is the fact that xenophobic and racist attitudes have entered mainstream thinking and become even more acceptable if parties – in an effort not to alienate potential voters – echo them. This entry was posted in Germany and tagged immigration, Nationalism, Pegida, populism. Bookmark the permalink.